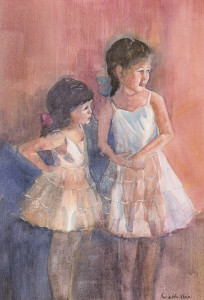 Anne S.Whalon, a signature member in the Pennsylvania Watercolor Society and the Philadelphia Watercolor Society, has had a distinguished career as an accomplished artist. Her award winning paintings have been selected for many professionally juried shows. Raised in Chester County,Pennsylvania, Anne received her formal education at Rosemont College and Villanova University where she earned a Bachelor of Fine Arts Degree. She later studied textile design at the Philadelphia College of Textiles and Sciences (since renamed Philadelphia University) and The Fabric Workshop in Philadelphia. Anne then worked in New York City as a textile designer and fabric stylist. Aftermore than a decade of professional textile design, she again turned her talents to her love of the Fine Arts. Her extraordinary knowledge of color acquired during her years of textile design is clearly seen in her fresh, loosely rendered and colorful watercolor and pastel paintings. Her personal style evidences both her love of painting and her subjects. Her work can be found in many private collections. She currently is an instructor at the Greater Norristown Art League. You may not copy these images without the permission of the copyright holders. www.WeSellFineArt.com Presented by Pine Ridge Productions, Inc.